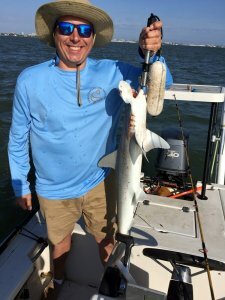 With huge tides and muddy water making for some tough inshore fishing, I asked Matthew what he thought about sharks. He replied that catching a shark would make his year. Off we went! Caught bonnetheads, sharpnose and blacktip consistently on cut shad. Needless to say, Matthew was happy!